adds the geo-referencing, metadata, and information that allows an update patch to be exactly registered with the old raster file to which it will be applied. NOAA and Maptech to create a small (1 to 100 KB with 99 percent smaller than 10 KB) patch for each raster chart. What does it mean to mariners? The weekly update service means that elec- tronic chart corrections come to you, every week, automatically - no forgetting, no chas- ing paper Notices to Mariners, and no delay in their application. The corrections arrive in a ready-to-apply form that a mariner's soft- ware can handle with little intervention. No more laborious, time consuming hand correc- tions are required - a process that has been particularly hard on the electronic charts. In addition, the updates can be printed and applied to a mariner's paper charts. This keeps both the paper and raster charts up-to- date and synchronized. The update service is really two services in one. With this new service, mariners always have both the charts and patches. This allows them to look at the old chart, the corrected chart, or to look at just the corrections. Professional mariners who travel the same waterway fre- quently value this capability since they rely on experience in addition to the chart. The abil- ity to see what has changed since their last transit alerts them where experience would be misleading. The same experienced nautical cartographers at NOAA who compile the new chart editions have compiled the raster chart updates. This almost completely eliminates mistakes in what has been an error prone process. In addition, critical changes received by NOAA from sources other than the Notices to Mariners are included thus giving mariners the best infor- mation available. The electronic raster chart updates are official and NOAA stands behind them just like they stand behind the charts. Coast Guard to develop suitable standards for electronic charts and systems that also could be used to meet the chart carriage regulations. This process is unusually complicated and long because NOAA and the Coast Guard must first help establish international stan- dards upon which the U.S. standards are based. ent pixels and unchanged pixels from the old chart show through. This novel differencing technique can be used to create sequential, week-to- week patches, or to create cumulative patches that include all changes since a new chart edition. It can also be used to overlay other geo-referenced raster data on top of the chart. NOAA also invested heavily to produce a reliable updating infrastructure. Sea trials in 1999 have proven the method and added to its robustness. The updating service became avail- able in January 2000 as a subscription, consisting of a weekly e-mail containing a hot link to the update computer server. Master E radars. Superior automatic target and shoreline recognition in the worst sea and weather conditions are incorporated into each marine radar unit. 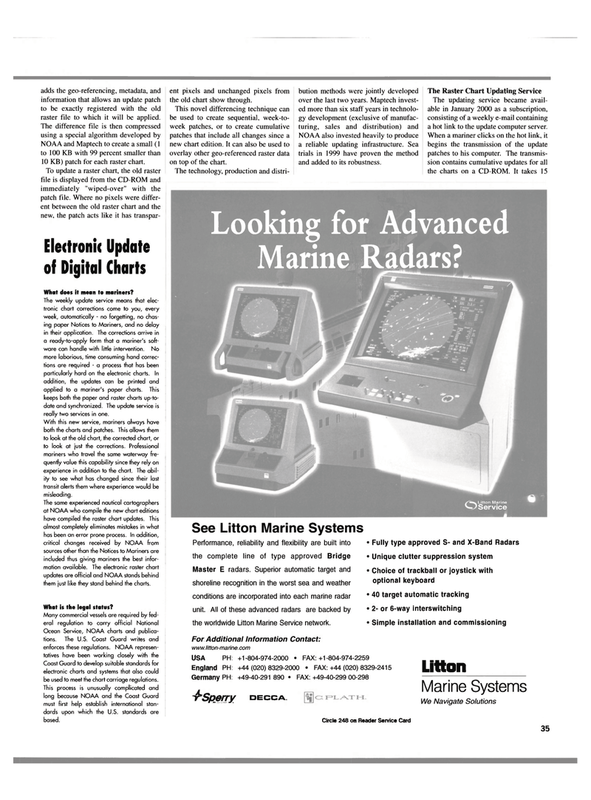 All of these advanced radars are backed by the worldwide Litton Marine Service network.